Nine year old Carlos loves to be outside, especially to play in the pool, jump on a trampoline or sit in a sandbox. He also enjoys the great mystery of outer space and can be found star gazing at the end of each day. Carlos enjoys helping with chores and really prides himself on being neat and tidy. At the end of each school day, Carlos places his sneakers on the staircase and folds his socks before he quickly requests to play outside. Carlos enjoys all types of food and his team would describe him as being “not a very picky eater,” however he seems to be picky about who the cook is! Carlos is in the third grade, he is DDD and ALTCHS eligible. The best fit family for Carlos would be a one or two parent home that has experience working with the special needs population. Carlos will be fine with other children in the home, both older and younger, as long as the children are patient and able to dance and sing with him. He will need long term care and his family will need to plan for his care into adulthood. Carlos is an intelligent child who is capable of advancing, but needs to be pushed out of his comfort zone to do so. A family who is able to take time out of their day to teach Carlos new things and follow up with verbal praise when he does something new, is the best fit for Carlos. He will bring a family a new perspective on life and teach a family patience, love and how to smile at the little things that life has to offer. 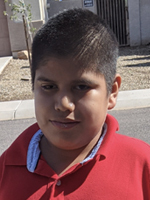 For more information about Carlos, please contact Brianna Rossi at (602) 930-4601 or via e-mail at brossi@aask-az.org.